Just letting you know that this creamy bowl of coconut curry soup is sponsored by my friends over at Vitamix! This easy curry coconut soup is made extra creamy with cauliflower and cashew cream! Top it with sweet potato noodles for a gluten free meal that is paleo friendly! 3 things that I am a gazillion % O-B-S-E-S-S-E-D with…blended all in O-N-E creamy-dreamy, magical soup EXPERIENCE. Like, I’m not even gonna call slurping this spicy-sweet, thick and rich deliciosness a “bowl” of soup. “Bowl” is too boring/common of a word. We’re straight-up calling this an EXPERIENCE. A journey to the land of INSANELY delicious comfy-cozy-fall food for your taste buds, if you will. I know it’s been kind of a cozy-comfy-fall food journey for the last week here on FFF, since we had vegan sloppy joes and PUMPKIN SPICE (yea, already went there) paleo cookies last week. But, I live for fall flavors. I COULD pretend that I love to eat light and healthy summer-type salads all day long. But, if I dig down WAY deep inside my TRUE real-life-honest self, I just want to eat bowls of scalloped sweet potatoes, paleo pecan pie bars, and anything cinnamony-sweet with pumpkin spice. 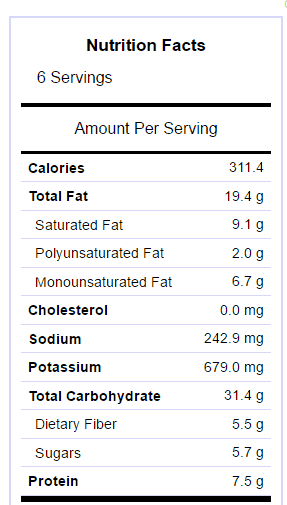 Healthy pumpkin cheesecake bars, I’m looking at Y-O-U. Now that we have that out of the way, I have a VRY VRY important life question for you: are you ready to get your slurpety-slurp onnn? Becaus-eeee that is bayyyysically all you are going to want to do when you simmer a little cauliflower to soft, tender yumminess, chuck in a good DOSE of spicy, flavor-poppin’ curry powder, mix and mingle a little superthick, ubercreamy cashew cream sauce into that already-epic list of good-things and then BUZZZZZ it all up in your Vitamix to make this thai coconut curry soup. 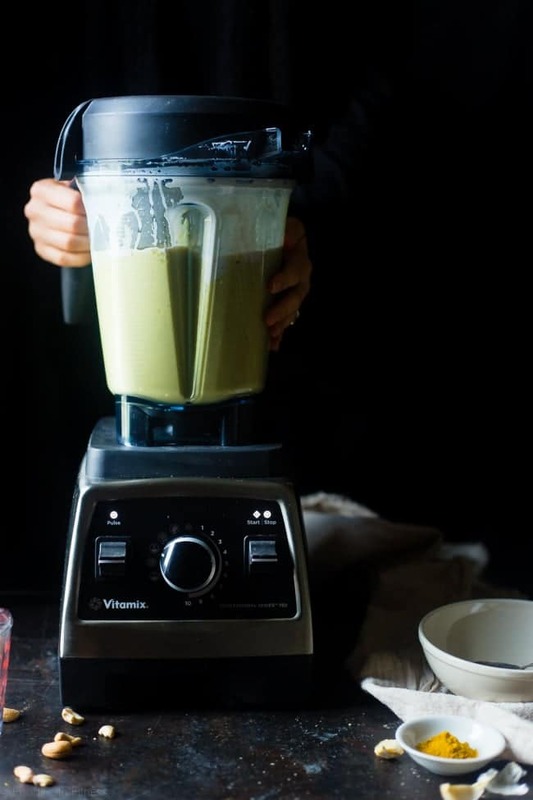 <–Did you know that the Vitamix can make ready-to-serve, SUPER hot soups in under 10 minutes? I just ran mine for JUST 2-3 minutes and it was PIPING hot yo’! Loooooove. 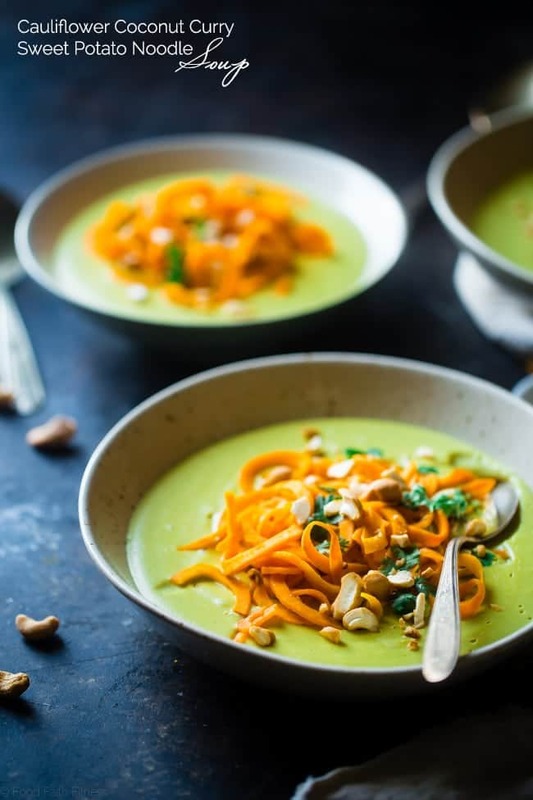 Did I mention a generous pile of tender-crisp, coconut-scented spiralized sweet potato noodles sitting inside the middle of the experience that is a bowl of veggie-packed velvety-smooth soup heaven? Do you remember the goodness of the creamy healthy carbonara with sweet potato noodles? They’re adding a crazy addicting texture component that your cozy-food-loving-self is going to be DEAD over. Dead in a good way though. Just FYI. 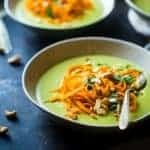 Speaking of the BUZZZ-in-your-Vitamix, I’m excited to partner with them and 4 other ridiculously talented bloggers to bring you 5 delicious soup recipes that feed your warm-food-craving-mouths this season. I’m pretty much debating living off soup for the next week just so I can do a little spoon –> mouth action with ALL these. SO SO good right now. In other extremely delicious news: have you ever made the VRY solid life choice to put cashew cream in a coconut curry SOUP? 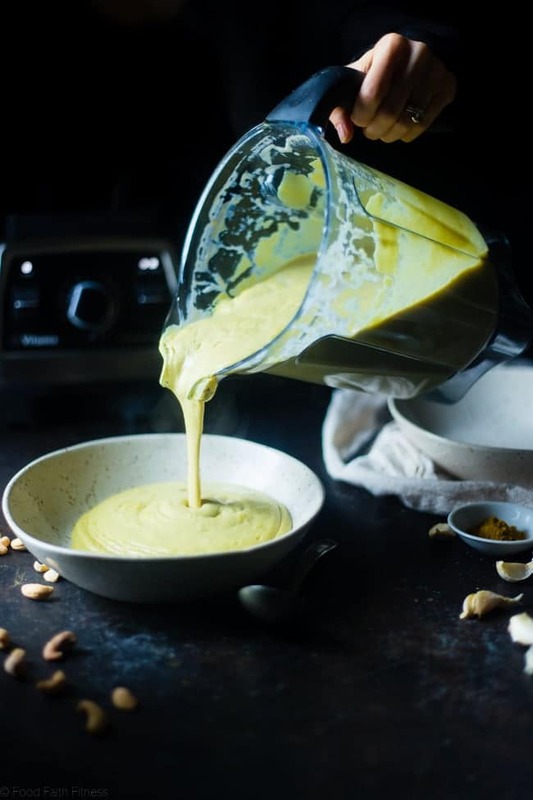 We’ve done nut-creams-in-soups ONCE before with the Moroccan cauliflower soup, but usually we cashew cream things like with berry cashew cream no-bake bars, and paleo cookies pizza with cashew cream, but those were all desserts. Cashew cream longs to trickle its thick and creamy, nutty-delicious self in ALL your meals: breakfast, lunch and dinner. ALL OF THEM. It’s kinda needy. And we’ve giving into it by using it in a lunch-OR-dinner application. Aaaaaand doing so swirls in a luscious richness that takes this soup OVER THE TOP, HOLY DELICIOUS. LIKE-WHOA-HOW-IS-THIS-SO-GOOD-RIGHT-NOW?! On the yum-o-meter (it’s a real thing) we’re scorin’ an eleventy billion and SIX right now. In the words of Shakira: my taste buds don’t lieeeeee. I might have adapted that line to fit the blog post a little bit. We do what have to dooooo. Which is also swimming around in bowl of spicy-sweet cauliflower coconut curry soup and EATING our way out. Heat the coconut oil up in a large pan on medium-high heat. Add in the garlic and ginger and cook until fragrant, just 30 seconds or so. Add in the cauliflower, onion, curry powder, sugar, salt and pepper and stir until the veggies are evenly coated in the spice mixture. Cook, stirring occasionally, until the cauliflower is fork-tender, about 5 minutes. Pour the coconut milk into the pot, stir and cover. Reduce the heat to medium and simmer 10 minutes. While the sauce simmers, heat the remaining 1 Tbsp of coconut oil in a separate large pan on medium heat. Add in the sweet potato noodles, toss to evenly coat in the oil and cook, stirring occasionally, until the noodles wilt and become fork tender. Drain the water from the cashews and place the cashews into your Vitamix. Add the 3/4 Cup + 1 Tbsp water and blend until smooth and creamy. I find it's best to start the Vitamix at the lowest speed and slowly turn to the highest speed. This gets the smoothest blend. Add the entire coconut milk/cauliflower mixture into the Vitamix. Turn the Vitamix to the "soup" setting and blend until smooth. Divide the soup between bowls, followed by the sweet potato noodles. Garnish with chopped cashews and cilantro. *I like really thick soup. If you want it thinner you may need to add more coconut milk, or even some vegetable broth to thin it a little. **I buy my cashews pre-toasted. Don't skip toasting the cashews, as it adds a lot of flavor. You can spread un-toasted cashews on a small baking sheet in a 350 degree oven and cook until lightly brown, if you need to toast them. Do this BEFORE soaking. THIS POST IS SPONSORED BY MY FRIENDS AT VITAMIX. THANK YOU FOR ALLOWING ME TO CONTINUE CREATING GREAT CONTENT FOR YOU BY SUPPORTING PARTNERSHIPS WITH SUPER-FAB BRANDS THAT FOOD FAITH FITNESS LOVES TO WORK WITH! AS ALWAYS, OPINIONS REMAIN 100% MY OWN! Don’t forget to enter the Vitamix giveaway! IF YOU MAKE THIS RECIPE, PLEASE REMEMBER TO TAG @FOODFAITHFIT AND #FOODFAITHFITNESS ON INSTAGRAM! I LOVE SEEING YOUR RECIPE RECREATIONS! ???? 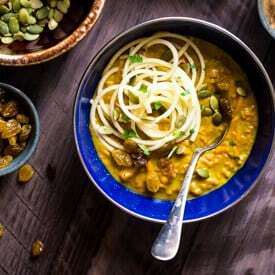 Want more cozy, vegan curry? Oh, girl! This is so made for me I can tell you right now!!!! Yep, I HAVE to make this! YAS you do. I can feel that you’d LOVE it! This looks so yummy, I need to try it! There should be a thing called a yum o meter! Ha ha! These photos are so dang beautiful! Love the soup and the giveaway. 🙂 I love my Vitamix to bits and use it all the time. Hahah I think there should be too!! And thank you for the photo love! I seriously love everything about this. First of all, soup is my favorite meal. Ever. Any kind. Anytime of day. Anytime of year. If I had to choose a last meal before I leave this Earth, it would be soup. Second, I LOVE my Vitamix! I use it at least once a day. It is so perfect for ultra creamy soups like this! Third, CASHEW CREAM. I could bathe in that stuff. Sweet or savory – it’s just so good! Fourth, cauliflower – only my favorite veggie ever! Fifth, texture – love all the textures you have going on here. Ok, I’ll stop now…but totally in love wiht this! Hahahahaha I LOVE this comment. I am so with you on soup being the mecca of all meals!! AND cashew cream AND Vitamix and cauliflower. I think we are the same person! I love curried Cauliflower soup! I’ve never thought to put sweet potato noodles in, but that makes an extra hearty meal! Yes! It really rounds it out to make it heartier! Thank you! This has me so ready for soup season! YES! It’s the best! Thanks Matt! I am so excited that soup season is here again!!! This is a great addition to my rotation for sure! You and me both – it’s the BEST season! Thanks Amanda! 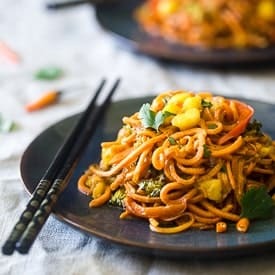 The sweet potato noodles looks awesome! Love the colors! This soup is beyond beautiful Taylor! And those flavors – yum. Thank you so much Alanna!!! I would love to try my butternut squash soup in a Vitamix! I bet it would be perfect! This looks SO delicious! I love making soups in my Vitamix! Me too!! Thank you Laura! Simply delicious! I love all of my favorite flavors and how quick and easy this beautiful dish is. Your photos are absolutely stunning! My husband hates curry which makes me want it even more! 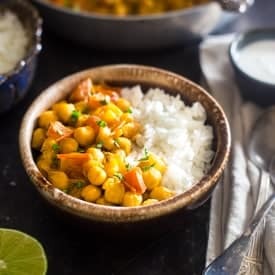 Just the thought of coconut curry makes me drool, I can’t wait to try this!! HAHAAH I Love that! How does he hate curry? My hubs and I could LIVEEEEEE off it!! This looks fabulous! I can’t wait to try it! If I won the vitamix I would definitely make this! I would also be blending everything in sight haha. I have wanted one of these forever! Haha, I TOTALLY feel ya! Good luck! This looks amaaaazing omg. I totally love for fall flavors too!! Making this ASAP. Thank you Molly!! I hope you LOVE it if you try it! These photos are GORG!! ???????? The first soup I want to make is Celery Potato Soup! I have such a weakness for potato soups! YUM! I’ve always wanted a vitamix! I would love to make all of the nut butters, and date bars! Good luck! Nut butters are the best! I’d make corn chowder! Or this delicious recipe you have posted! How did you know that I was getting cauliflower today and sweet potatoes? Seriously, it is so amazing how God is working in the little and the big things and all the things in between! That is seriously SO cool!! If you make the soup I hope you love! Wow, this recipe is da bomb! Love how creamy and velvety it looks, coconut+cauliflower best combination! Can’t wait to try it, especially with your genius idea of adding some sweet potatoes and crunchy cashews on top. This is one gold medalist recipe, thank you!! Thank you SO much for all the kind words Stella! I LOVE me some sweet potatoes! WELL, that is a huge compliment from a “cauliflower hater!” I am SO pumped you guys liked it! Thanks for letting me know!! Not only does this sound delicious, it’s over the top, reach in and twirl some noodles, gorgeous and enticing! Thank you SO much Alisa! 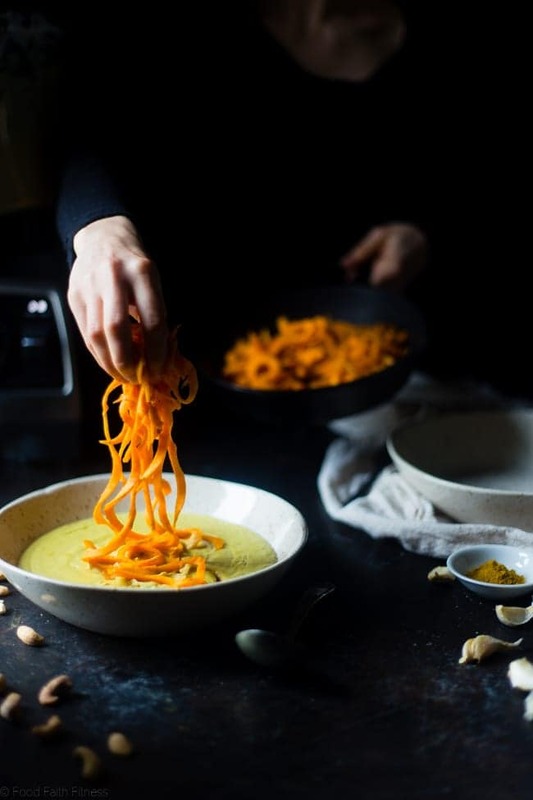 This soup looks absolutely divine and your photos are just stunning. I look forward to trying this recipe out. Thank you for sharing ???? That vitamix though – the holy mecca! I am absolutely totally in love with mine. But let’s talk about this soup – you took it to another level with those sweet potato noodles!!! RIGHT! it IS the holy mecca! I love mine soooo much as well. It’s all about the sweet potato noodles – my life! YES. I love everything about this! Looks amazing, lady. My cauliflower-based curries, sweet potato kabocha puddings, and protein “ice creams” GALORE. And the fact that you put sweet potatoes, green curry and cauliflower in this recipe is just that amazing! If I can link this in one of my future posts to recommend to others, that would be great! Hi girl! Yes you can totally link to it! As long as you don’t post the full recipe, and it’s just a link to this post of course! and i need your kabocha pudding recipe!! I would definitely make yours, it sounds delicious! After that I might make my favorite Tomato-Basil Bisque. I LOVE anything with tomatoes and basil! Yum! Fall is coming and I need to add this soup to my to-do list! Your pictures are gorgeous too! Thank you Maria! I hope you love it if you try it! 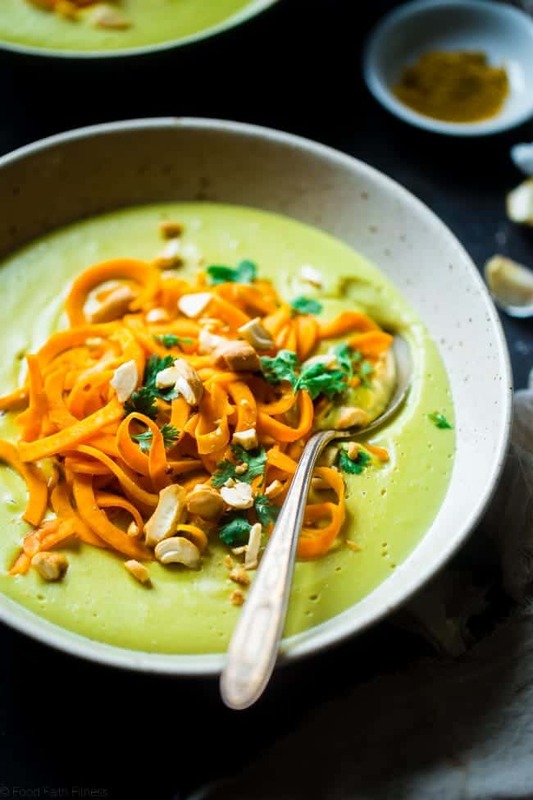 Love the sweet potato noodles on top of this colorful and vibrant soup! I also love the way you photographed the blender! This looks divine! 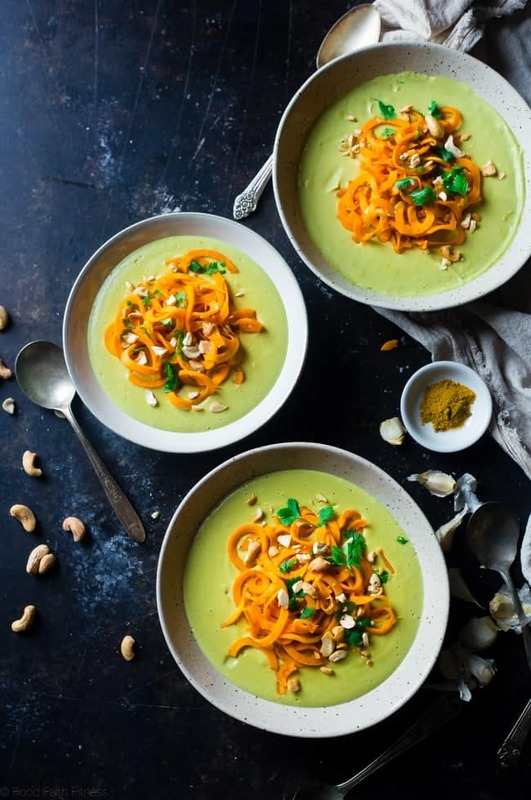 Love anything Thai but those sweet potato noodles look so pretty in the green sup! Yum! This recipe looks awesome! I would want to make this soup, my own soup recipe, and all of Vitamix’s recipes if I won the Vitamix! yummy! I like your style! Good Luck! I personally don’t think it depletes it at all. And it adds the flavor that this soup needs, so I do really recommend you toasting them, or else the recipe taste will change! Thanks! Yay! This makes me so happy! !